These five protagonists of a new global agenda differ from past critics from the left both in the style andsubstance of their politics. The politics of change, reform and peace in the near immediate period has a particular complex, heterodoxcomplexion, which contains traditional conservative and popular components. These leaders have a global audience and major impact on world public opinion – and indirectly and directly on Western politics. These five leaders defy the traditional left-right division. Pope Francis demands immigrant rights, equal pay for women, diplomacy and peace negotiations instead of war, and greater class equality. He excoriates neoliberal, capitalism (“the dung of the devil”). But he also defends traditional Catholic doctrine on abortion, divorce, contraception and homosexuality. He opposes class struggle and social revolution in favor of class collaboration, dialogue, and negotiations. President Putin favors negotiations and peaceful resolution of conflicts in Syria and the Ukraine. He is an ardent advocate of a global coalition to fight Islamic terrorism. He has sharply reduced western pillage of the Russian economy and restored salaries, pensions and employment. He has restored Russian military capacity and national security and reduced terrorist assaults from the Caucuses. At the same time Putin supports some of the biggest Yeltsin era billionaires; is closely aligned with the conservative Russian Orthodox Church; and is excavating the remains of the last tyrannical Russian Tsar to honor him and his family. President Xi Jinping has played a leading role in promoting increases in consumer spending, wages, pensions and social welfare. He has deepened links with US high tech industries and signed off on a major reduction of carbon fuels and pollution, offering $3 billion dollars to fund alternatives for less developed countries. He has fired, prosecuted and jailed over 250,000 corrupt government and party officials who exploited and abused the public, while limiting operations of speculative Western hedge funds. At the same time, Xi retains the authoritarian one party system; defends China’s one hundred-plus billionaires; and restricts all forms of independent class political and trade union organizations. Hassan Rouhani is both devout practicing Muslim and a staunch advocate of peace. He supports a ‘nuclear-free Middle East’. He is a consequential opponent of terrorism by Salafist Islamists, Zionists, Christians and Hindus. He is the leading critic of Saudi Arabia’s military intervention in Yemen and a principled defender of national self-determination. Internally he has reduced authoritarian state controls and censorship of free expression and promoted scientific and technological research – in a country where half of research scientists are women. President Rohani has signed a high risk peace agreement with the US and its partners (5 + 1) dismantling Iran’s nuclear facilities and opening its military installations to international inspection by an international atomic agency of dubious neutrality. At the same time, Rohani opposes a secular state, supports liberalizing the economy, invites foreign multi-nationals to exploit lucrative oil and gas fields, and supports the corrupt and regressive US backed Shia regime in Iraq. He advocates a democratic foreign policy that opposes Anglo-American and Israeli imperialism in the Middle East and elsewhere. However, upon taking office as head of the neo-liberal, pro-imperialist Labor Party, he confronts a parliamentary party dominated by his adversaries. His appointments to the “shadow cabinet” are overwhelmingly pro-NATO and pro-European Union; some even oppose his Keynesian budgetary agenda. Moreover, Corbyn endorses ‘working in the EU’ and promises to support a ‘yes vote’ in any referendum, even as the world witnessed how the EU imposed harsh austerity budgets on Latvia, Greece, Spain, Portugal, Ireland and other countries in financial straits. There is no question that these five leaders have made a major impact on world public opinion on issues of peace, climate change, equality and the need to reach international agreements. In most cases one or more of the leaders have exercised greater influence on a specific public or region and have had a greater impact on some issues over others. The Pope, for example, has greater influence on Christians; Rohani on the Muslim public; Putin, Corbyn and Xi on secular opinion. Xi and the Pope have a greater impact on proposals for climate change. Putin, the Pope, Rohani and Xi are prominent in advocating peaceful resolution of conflicts; Corbyn and the Pope on reducing inequalities and securing social justice. With the exception of Corbyn and Xi, all support traditional religious beliefs and observances. Most are ‘ecumenical’ in the sense of supporting religious tolerance. Most important, all pursue these goals through persuasion, diplomacy and winning over public opinion. None of these world leaders have invaded or overthrown incumbent adversarial regimes or occupied countries. All are leading opponents of terror – especially ISIS. President Putin is playing a leading role in challenging President Obama to join a broad coalition, including Bashar Assad and Iran, in fighting ISIS terrorism. Washington, despite its rhetorical hostility, was pressured to respond – ‘partially favorable’. President Putin has also taken the initiative in the Middle East. He leads a coalition, including Iraq, Iran and Syria to co-ordinate the war against terrorism. China’s President Xi has committed military forces in support of the Russia’s anti-terrorist proposal for Syria. The Pope has offered tacit support via his pronouncements against terrorism and for international coalitions. As a consequence of the massive flood of refugeesresulting from the US-EU-Saudi-Turkey support of Islamist mercenaries invading Syria and Iraq, several European allies of Washington are reconsidering their anti-Assad policies. They are moving toward the broad front proposals of Putin-Rohani-Xi and the Pope. The social-economic impact of the Pope’s call for social justice is less apparent, apart from the routine lip-service from Western leaders. Among the quintet, Rohani is looking toward ‘market solutions’: inviting Western and Asian investors to revitalize the oil industry. Xi is cracking down on big time fraudsters in China and abroad, but has yet to embrace a comprehensive welfare and incomes policy. Putin presides over a petrol-economy in recession and has relied on private corporate oligarchs and overseas investors to regain growth. Corbyn’s egalitarian pronouncements have little impact among Labor Party politicians and his shadow cabinet. Moreover, he appears reluctant to mobilize the rank and file Labor activists for a fight for his program within the Party. The climate change and environmental struggle received robust backing from the Pope –in his speeches to the US Congress, the United Nations and in his mass gatherings. President Xi reinforced the message by proposing to fund a massive clean air program for the less developed countries, while setting rigorous targets to reduce pollution in China. There is no doubt that their message is well received by all environmental groups and the general public. Some political leaders, including Obama, appear to be, in part, receptive. Rohani, Putin and Corbyn have played only a minor role in the defense of the environment. The US, EU, Japan, Israel and Australia, referred to as the ‘Western Powers’ paid lip service to the cause of peace, while continuing to pursue military objectives via air wars, cross border terrorist activities and military build ups. In general terms, they manipulate a double discourse – of talking peace and bombing adversaries. However, the Western Powers feel the pressure of ‘the quintet,’ which is winning the political ideological contest. The ‘Russian threat’ is no longer viewed as credible by most of the international public. China’s international financial initiatives have gained major support from across the globe. Japanese militarization has provoked mass domestic unrest and regional concerns – especially in Southeast Asia. Israel is a pariah, not just in the Middle East but is increasingly viewed with hostility by the rest of international public opinion. Germany, Europe’s leading economic power, has been discredited because of the massive fraud scandal by Volkswagen, its leading automobile maker and major exporter. 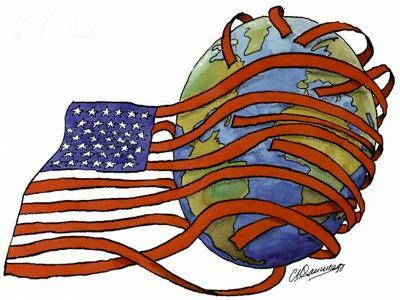 In other words, while the Western Powers retain military superiority and important markets, their overseas policies have suffered severe setbacks and their leaders have lost credibility. Their domestic and overseas supporters are turning against them. Moreover, the moral authority of Western leaders has been severely questioned by the Pope’s harsh critique of the ‘exclusionary’ policies toward immigrants and refugees, the excessive greed of capitalism, the reliance on force instead of diplomacy and the massive human suffering due to capitalism’s unrelenting destruction of the environment. The Pope’s generalities would not have had such a powerful political impact, if they were not accompanied by (1) the selective use of arms and diplomacy emanating from President Putin; (2) the diplomatic successes of President Rohani; and (3) the economic muscle of President Xi, in support of economic development and international co-operation on the environment and climate change. From widely divergent origins and diverse ideological backgrounds, five political leaders have set a new agenda for dealing with war and peace, equality and inequality, security and terrorism and environmental protection. Except for Jeremy Corbyn, who in any case will probably be rendered impotent by his own party’s elite, none of these progressive leaders’ ideologies is derived from the secular left. They challenge the status quo, and raise the central issues of our time, at a time when the secular left is marginal or self-destructs (as Greece’s Syriza, Spain’s Podemos or Italy’s Five Stars in Southern Europe). Faced with this heterodox reality, the Left has the choice of (1) remaining in sterile isolation; (2) embracing one, some, or all of ‘the quintet’; (3) or aligning with them on specific pronouncements and proposals. The five have sufficient drawbacks, ‘contradictions’ and limitations to warrant criticism and distance. But in the big picture, on the major issues of our time, these leaders have adopted progressive policies, which warrant whole-hearted active support. They are the only ‘show’ in the real world – if we are serious about joining the struggle against imperial wars, terrorism, environmental destruction and injustice.